At the end of a long, cold day all I want to do is come home and eat something super easy. Like the jelly bellies on my coffee table (why do I keep those there again?!). After having too many of those (need to hide them! ), I hunted through the fridge and pulled out all the produce we have. One of the cool things about salads and other veggie dishes is that you can clean out your fridge by whipping up a random assortment of everything you have! I had bought some salmon earlier that day. 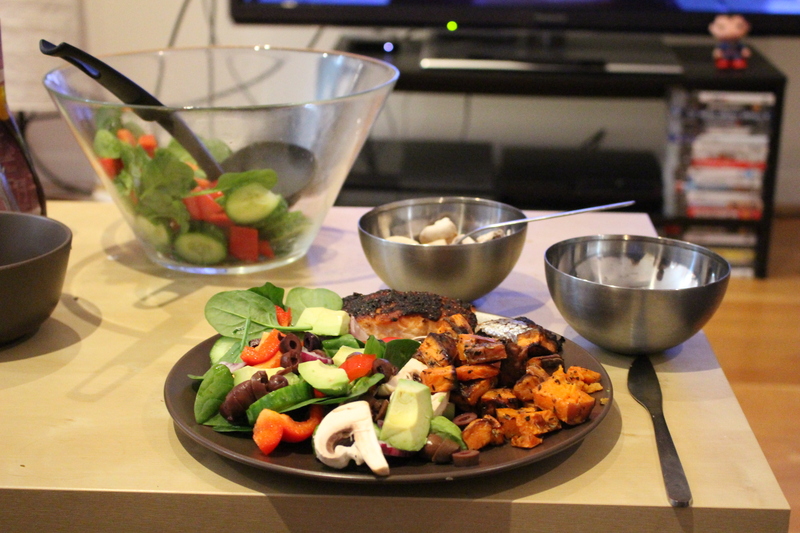 Salmon, salad and roasted yams/sweet potatoes/etc is one of my favourite dinners. It’s full of vegetables, protein, healthy fats, and is low in carbs. The best thing I ever did for healthy eating was to make sure our fridge is stocked at all times. It’s easy to pull out a few things and cook them into a magical meal. I wish I had salmon in the fridge more often though. One of the tastiest, easiest things to cook ever! Totally agree! An organised, stocked fridge is key 🙂 And salmon!